MILAN -- The leader of Italy's 5-Star Movement called Thursday to award speedy citizenship to a 13-year-old Egyptian boy hailed as a hero for being the first to alert police that he and scores of his middle school classmates had been abducted by their bus driver. Ramy Shehata “put his life at risk to save that of his classmates,” Luigi Di Maio said on Facebook, adding that he would ask Italy's premier to confer citizenship for special merit. 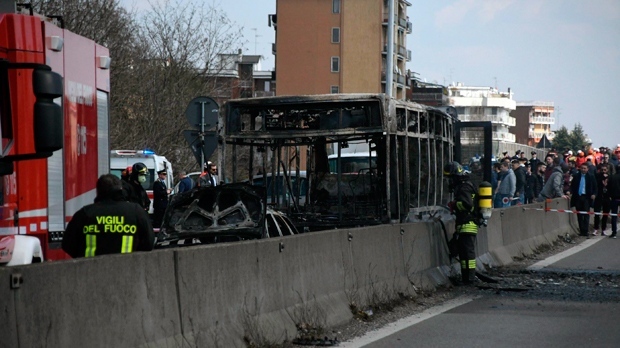 Law enforcement officers on Wednesday stopped the bus that had travelled 40 kilometres (25 miles) from the province of Cremona to Milan, freeing the 51 middle school students and their chaperones as the driver set the bus on fire. No one was seriously injured.